Franz Kafka's writing has had a wide-reaching influence on European literature, culture and thought. 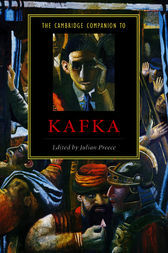 The Cambridge Companion to Kafka, offers a comprehensive account of his life and work, providing a rounded contemporary appraisal of Central Europe's most distinctive Modernist. Contributions cover all the key texts, and discuss Kafka's writing in a variety of critical contexts such as feminism, deconstruction, psycho-analysis, Marxism, Jewish studies. Other chapters discuss his impact on popular culture and film. The essays are well supported by supplementary material including a chronology of the period and detailed guides to further reading, and will be of interest to students of German, European and Comparative Literature, Jewish Studies.